With breakthrough solutions packed into every inch, the award winning "Ed" Table truly embodies the inventor’s spirit—providing the most complete maker experience available. Maximizing creative time while minimizing the amount of logistical preparation work and clean-up was the driving factor behind the design concept. For schools and teachers interested in project-based learning, the award winning "Ed" Table is a natural extension and fundamental element for engaging learners. The Ed Table wins the IIDA award at EdSpaces! The number eight signifies a new creation and CEF believes in the creation of new & innovative products! We’re excited to announce a new member to the award winning Ed Table line, the Ed8. The Ed8 is a modified version of our original Ed Table which allows for two additional seats on the ends of the table. The Ed8 has a reduced size base from the original Ed Table, thus eliminating the trash component. However, a larger mid storage space,upgraded electrical and two extra seats were created. 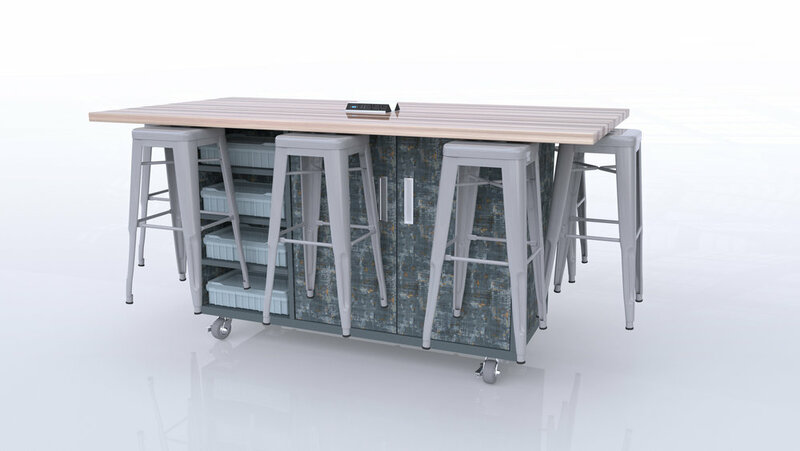 Just as our original Ed Table, The Ed8 is offered as an all inclusive solution which provides eight metals stools with color of your choice, 6-8 storage bins with lids, electrical and a collaborative work-space like no other. Show and tell will never be the same with our Dry Erase Tilt Table! By giving students the freedom to write, draw or solve problems on a dry erase surface, it cultivates creativity and encourages students to become more confident in their work. The tilt feature of this table is an added bonus for teachers and students, serving as a great way to display student work or to instruct from! Designed by kids, built by us! The award winning Stewart Storage Cart was designed by three students who attend an after school maker club. The cart is named after their school, Stewart Middle Magnet School in Tampa, FL., and is a perfect addition to a makerspace, art class, or any classroom. It boasts 10 customizable storage bins and a peg board side, coupled with mobility and a compact design, this award winning Stewart Storage cart is a must have for any classroom! Our compact, feature rich Multi-Maker Cart has a small footprint with a big impact. The Multi-Maker cart can be used as a presentation cart, a great addition to your makerspace room, or a charging and storage solution for a classroom or media center. Or...can be all of those things at one time! Let us help you organize so you can teach and make! Our metal "Pop of Color" stools are a great compliment to the Ed Table, Collaboration Table & Butcher Block Table! Available in 24" or 30" heights and is offered in multiple colors! Make your makerspace bright and inviting! The First Truly Customizable Maker Table! The Quad Pod table by CEF is a revolutionary concept in educational furniture design! This design layout allows you to customize your table according to the storage and functionality needs that you may have in a makerspace or classroom. CEF has designed four different square "pods" that allow for storage, a trash bin, device charging & storage or storage with bins. You can mix & match the pods, or have all four pods identical-your choice! These four pods drop into a metal frame on casters that form a sturdy base for a 48x48 butcher block top that secures to the pods, thus creating the most flexible and ingenious collaborative table around! Our new sit to stand height adjustable pneumatic base has mastered the balancing act! Mounted to the 72" collaboration or butcher block table makes for an effortless adjustment in your work space. It's broad range of 28" to 43" height adjustment caters to all age groups. The easy single hand height adjustment will make you fall in love with this new ergonomic base! The Multi-Maker XL is the big brother to our smaller Multi-Maker cart! It was co-designed by our friends and partners with UDT to house a large 3D printer and a specialized PC on top. It features a peg board back, ventilation fan, keyboard pull out and dual locking front doors. It has a customizable internal shell! The Ed Double captures many of the same features as the Original Ed Table with the exception of the trash component being removed and extra storage being added. Upgraded features include 16 storage bins with lids and integrated electrical now offering a VGA & HDMI connections. As always, The Ed Double is offered as an all-inclusive piece that provides 6 stools, storage bins with lids, power and choice of 36” or 42” height. The Ed Double is truly the ultimate turn-key maker table! while quietly boasting clean lines, calming colors and silent motion. Our Collaborative Team Table instantly sparks creativity and empowers students to work together by offering a dry erase surface, adjustable leg heights for sitting or standing workspace, optional power unit and monitor arm. Foster freedom and see where your students will go! Our Butcher Block Table for makerspace environments allows students to design and build creative projects and empowers students to work together. By offering a hardy work surface, adjustable height legs for sitting or standing, optional power unit and monitor arm, the sky's the limit! Foster a creative environment and see where your students will go! Our versatile storage bins with lids and dividers help keep your makerspace room organized! Several of our products are designed to use these bins in an interchangeable scenario between our tables & storage carts! We love our bins! They are sturdy and can stack with or without the lids on. These industrial strength rigid plastic bins, with customizable dividers, are built to last!